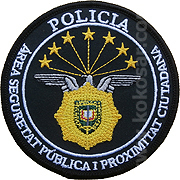 Nacionalna policija Andore (Katalanski: El Cos de Policia d’Andorra) je 2002. godine brojala 50 policajaca na broj od otprilike 70 000 stanovnika. Policija ima četiri odjela: prvi odgovoran za istrage i prevenciju sa odjelima za borbu protiv zloupotrebe droge, organiziranog kriminala, nasilja u obitelji, pranja novca itd. Drugi uz ovo ima u svojoj nadležnosti i nesreće u planinama. Odjel javne sigurnosti ima dvije jedinice uniformiranih policajaca. Odjel prometa i granične sigurnosti takođe ima dvije uniformirane jedinice. Tu je i šest grupa sastavljenih od sva četiri odjela: osiguranja VIP osoba, pirotehničari, održavanje reda, djelovanje u kritičnim situacijama, odjle vodiča pasa i odjel za spašavanje u planinama. 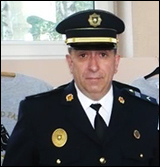 Policija Anfdore ima vrlo razvijenu suradnju sa policijama susjednih zemalja sa kojima ima česte zajedničke vježbe. 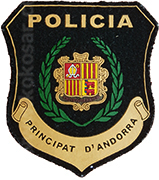 The Police Force of Andorra (Catalan: El Cos de Policia d’Andorra) is the national police of Andora. In 2002, the force had 50 officers serving a population of approximately 70,000. There are four Divisions with the following responsibilities: The Division of Criminal Police is in charge of criminal investigations and divided into two investigation units. The first one, responsible for investigations aimed both at prevention and repression of crime, has sections dealing with drugs, domestic violence, organised crime, general affairs, juveniles, and money laundering. The second investigates crimes brought to its attention and is also responsible for cases of alpine accidents. Also in this area is the National Central Office of Interpol. The Division of Public Security and Proximity comprises two uniformed units whose role is to ensure the overall safety and security of residents. 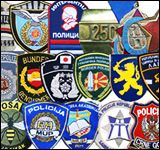 The Division of Transit and Borders comprises two uniformed units: the Traffic Unit (similar to highway patrol, motorcycle patrols to supervise the movement of vehicles at the national borders and intervene in case of accidents) and the Borders Unit that works in co-operation with the Department of Immigration. Six groups – for the protection of VIPs, bomb disposal, order maintenace, emergency situations, sniffer-dog training and mountain rescue – are formed by members of the four Divisions; are assembled in response to specific needs; and are assisted by colleagues from neighbouring countries, particularly in organising joint training programmes.